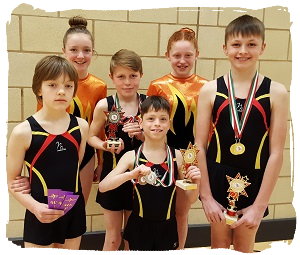 Kestrel gymnasts competing in the South East Gymspire Championships held in Cardiff came out proudly showing trophies and medals. Clare John was rewarded with a Bronze Medal with a very good Handspring Vault in the 13+ Mixed age group, and Tom Hook with an excellent Vault had the highest score of the day winning Gold, and also Silver on Floor and Bronze on Trampette. Tom went on to take the Overall Champion Trophy. In the Boy's 11-12 age group Evan Thomason took Silver on Trampette, and Bronze on Vault and Floor, winning third Overall Trophy, James Davies won Gold on Vault Silver on Floor and Bronze on Trampette, second Overall Trophy, and Finley Stenner took Silver on Vault, Gold on Trampette and Floor, winning the Overall Champion Trophy. Lilly Edwards, Martha Linden together with Finley, Evan and James won Overall Team Bronze. Tom, Finley, Evan and James have been selected to represent the Region in the Welsh Finals at the end of October. Clare is looking forward to competing in the Individual section. Kestrel Gymnastics Club's Squad gymnasts, aged 3 yrs onwards, put on a great Summer Show for their family and friends, showing their skills on all apparatus. The gymnasts proudly demonstrated what they had achieved since last year's performance, from Development Squad level to those at National level. 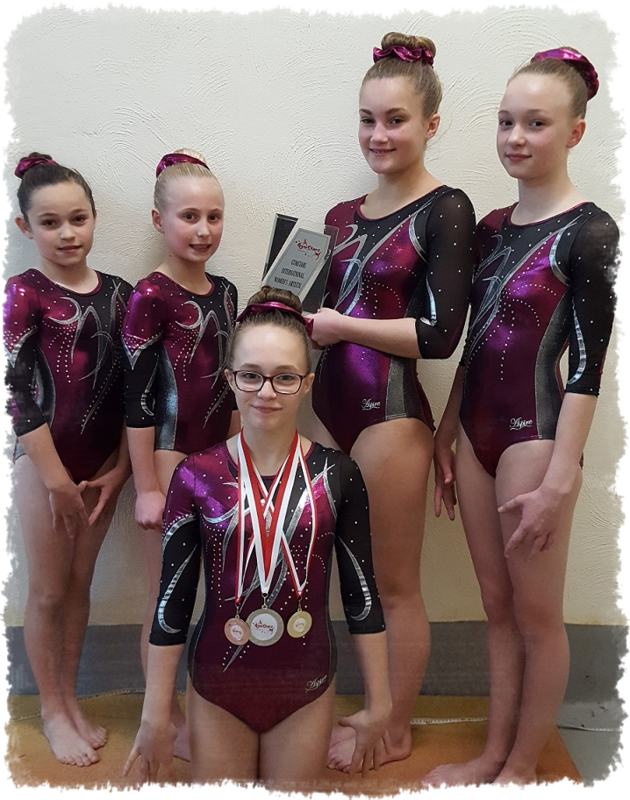 Kestrel has had many competition successes this year, and hope to do well with gymnasts competing in the British Tumbling NDP Finals in Telford, and in the Adult British Championships before the end of the Summer. Kestrel Gymnastics Club had a Silver medallist in the British Semi Finals NDP Tumbling at Barclaycard Arena in Birmingham. Eleven year old Joseph Dunster had a great competition in NDP Level 3 11-12 yrs age group. 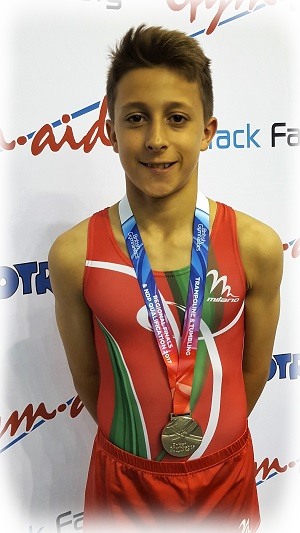 Joseph was on top form executing all three set tumbles well, and now goes forward to the British Finals in July being held at Telford International Centre, Telford. Kestrel boys had an excellent day at the Welsh Prelims Championships in Cardiff. 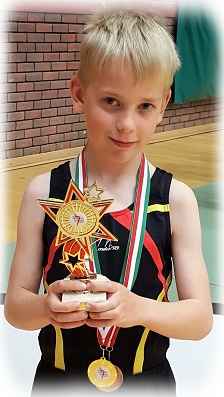 The boys had to complete two Vaults and two Tumbles, and in the 8yrs Phase 2 section, Henry French was Vault Champion, and won Bronze on Tumble and won second overall trophy. In the 9-10 yrs Phase 1 section, Hari Jones was Vault Champion, and placed 4th on Tumble and Overall. Haydn Thomason was placed fourth on Vault, third on Tumble, and won third Overall trophy. Henri Jones-Dekerf won Silver on Vault, Gold on Tumble, and Overall Champion Trophy. They were absolutely delighted to received their medals and trophies. Kestrel gymnasts were smiling again at the Welsh Prelims Championships at Sport Wales National centre in Cardiff. This time the Phase 3 gymnasts competing Tumble and Vault did well in the 11-12 yrs as James Davies won Bronze on Tumble and Vault, and Bronze Overall trophy, Dovydas Zagorskis won 4th place Ribbons on Tumble, Vault and Overall, and Finley Stenner winning Gold on well executed Tumbles, Silver on Vault and second place Overall trophy. The boys went on to win Team Silver. 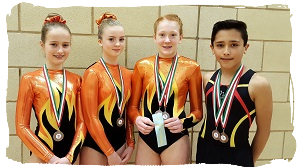 In the 13 yrs+ section, Tom Hook performed an excellent Vault winning a Gold medal, and fifth Overall Ribbon, Cora Chilsholm won Silver on Tumble, fourth Ribbon on vault, and Silver Overall, Daisy Macharg won fifth Ribbon on Tumble, and together with Florence Worgan, the four gymnasts took Team Silver. A very good performance by all the gymnasts. Kestrel gymnasts kept up the pace in the Welsh South East Prelims Championships competing Tumble and Vault. In Phase 3 11-12 yrs section, as well as winning individual medals, Dovydas won 4th place Overall Ribbon, James Davies 3rd Place Overall Trophy, Evan Thomason second place Overall Trophy, and Finley Stenner was Overall Champion as well as winning two Individual Golds. Honey Manley and Lilli Edwards had a good competition in the Level 2 section. 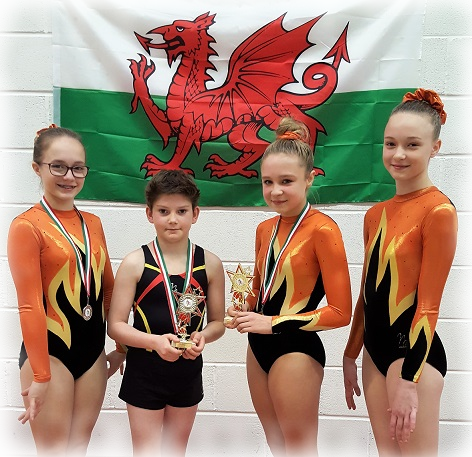 In the 13 yrs+ Phase 3, Tom Hook won Bronze on Vault, Cora Chisholm won 6th place Ribbon on Vault and Bronze medal on Tumble, and together with Daisy Macharg and Florence Worgan, the four gymnasts took Team Bronze. They are now working towards the National Prelims taking place in May in Cardiff. Kestrel's mini squad aged 5 yrs to 7 yrs, were off to the South East Wales Level 1 Prelims Championships in Ebbw Vale. It was their first competition for the little gymnasts, and they had been perfecting their two tumbles and two Vaults during many weeks of training. Laci Watkins won Bronze on Tumble and 4th Ribbon Overall, Carys Fullerton was Tumble Champion taking Gold, Amelie Thomason was Vault Champion winning Gold and 5th Ribbon Overall. the girls went on to win Team Silver with good tumbles from Hollie Smith and Mollie Greenhalgh. 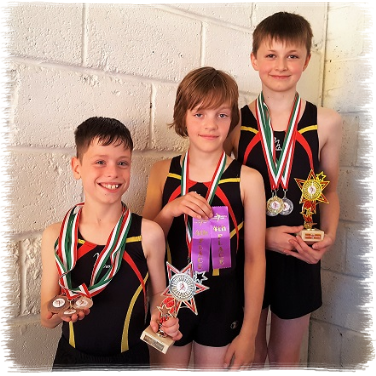 Good competition in the Boys' section from Brereton Trim won two Gold medals, becoming Tumble and Vault Champion, and Overall Champion Trophy, and Louis French was in second place winning two Silver medals for Tumble and Vault and Second Overall Trophy. The boys, together with Carys, took Overall Team Bronze. 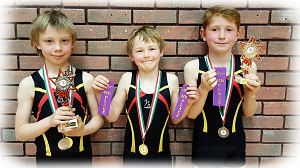 In the 9-10 yrs Boys' section there were good performances from all three gymnasts. Haydn Thomason won Silver on Vault, 5th Ribbon on Tumble and 5th Ribbon Overall. 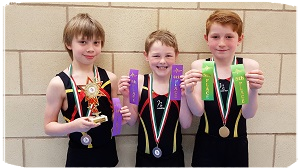 Harri Jones won Bronze on Vault, 4th Ribbon on Tumble and 4th Ribbon Overall, and Henri Jones-Dekerf won 4th Ribbon on Vault, Bronze on Tumble, and Bronze Overall Trophy. It was a good start to their competition year. 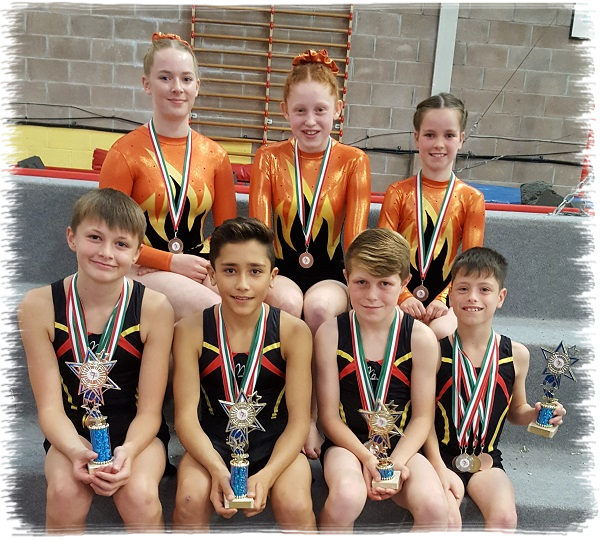 Kestrel gymnasts ended their last competition of the year at the Welsh Tumbling Championships in Cardiff with great results. 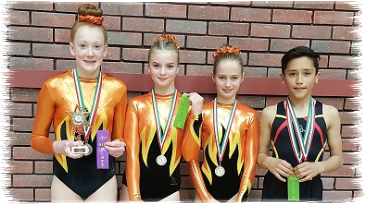 The four gymnasts performed three different tumbles in Intermediate Level 2, and gave their all with fast tumbling and good landings on somersaults. Joel Kohler-Hoon was Champion in the Boys' 11/12 yrs section, and although not placed, Georgie Davies had a good competition. in the 13/14 yrs section, Jessica Ham won Silver, and Kestrel had another Champion with Lily Brain taking Gold. We look forward to new challenges in the new year after a short break. Kestrel gymnasts are back from Malta after competing in the Gym Stars Artistic International competition. The girls had a great experience and thoroughly enjoyed their first international, meeting gymnasts from European countries and Australia. They returned with a friendship trophy, and Jessica Ham was absolutely delighted winning Gold on Vault, Bronze on Bars, and Silver Overall in the 13-15 yrs section. All are now back in training, and looking forward to more international competitions in the future. 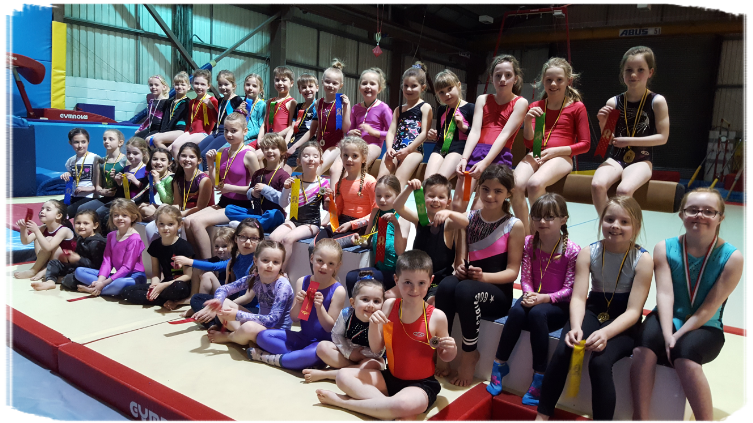 The Recreational gymnasts at Kestrel Gymnastics Club, had their turn to shine at the Club Championships. The gymnasts from 4 years onwards, attend a weekly hour training session, and had been training hard, learning Tumble & Vault routines. 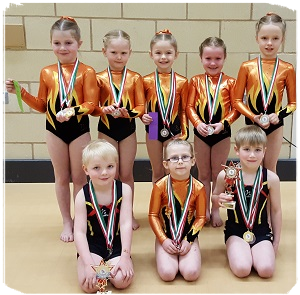 It was their first competition for the majority of the gymnasts, and they performed with great confidence in front of a large audience of proud parents and friends.